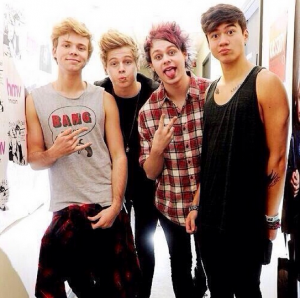 5 Seconds of Summer is a pop rock band created in Sydney, Australia. The band has four members: Luke Hemmings (lead vocalist & plays the guitar), Michael Clifford (guitar & vocals), Calum Hood (bass guitar & vocals) and Ashton Irwin (drums & vocals). The band began in December 2011 when three of the band members in the group started posting covers that they performed together of popular songs on YouTube. Their cover of Chris Brown and Justin Bieber’s “Next to You” received a lot of attention, making it their most popular cover. Drummer Ashton Irwin joined the band in 2011, and as the band progressed it received a lot of attention from big music labels, later on signing a deal with Sony ATV Music Publishing. The band released an EP entitled “Unplugged,” which reached number three on iTunes Chart in Australia. In 2012, they spent their time writing and creating their sound with Australian band members in Amy Meredith, Christian Lo Russo and Joel Chapman. On November 19, 2012, the bad released their first single “Out of My Limit”. A few months later, the band joined One Direction on their worldwide “Take Me Home Tour”. The band began to gain its popularity as a result of the tour. On November 2013, the band signed with Capitol Records and are currently working on their debut album. In late March of this year, the band reached the number one spot on the UK charts and it has been announced that they will be joining One Direction again on their 2014 “Where We Are” tour. Their EP “She Looks so Perfect” has been debuted at number two on the album charts in the U.S.
Man Dies at Bart Station.